If you are running out of swear words to comment the magic smoke coming from your electronics, [Howard] has just the right weekend project for you: The reverse swear box. Most swear boxes would have you drop in a coin as penance for uttering your choice phrases. Instead, at the touch of a button, this obscure but classy device randomly suggests a four letter swear word and displays it on a 14-segment LED display for immediate or later use. It’s built upon an ATmega168 and only requires a minimum of external components. The schematics and firmware for this project are freely available on the project page. There’s also an extremely profane header file, packed with 37 case-insensitive four-letter words you may not actually want to include in your toolkit. On the other hand, many of these words score intimidatingly well at Scrabble. People in search of something profane to adorn their coffee table need look no further. 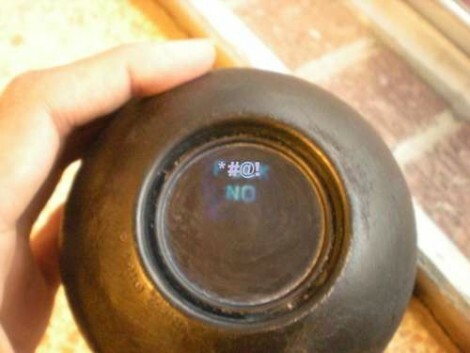 [Wizgirl’s] magic 8-ball hack lets you change the messages inside, and her messages all include the most powerful of four-letter-words. To do so she completely replaced the message cube inside with one she built from a sheet of plastic, plastic label-maker labels for messages, and craft googly eyes to make it float… Brilliant. The whole thing was reassembled along with the original fluid but she’s not done yet. A bit of creative case modifications leaves this magic 8-ball looking like a cartoon bomb, complete with a thick white fuse. She’s now the proud owner of a magic f-bomb. Florian Festi wrote a reply on MPRT - Modified planetary robotics transmission.